Finally, a proven program designed to help you safely and effectively treat Adultitis! Disgusted with the condition we found ourselves in, we wondered if it was possible to systematically turn the tide on Adultitis. We couldn’t afford to set up a research team to develop a vaccine. We didn’t have the stamina to attempt a triathalon to raise funds. And when it comes to those little ribbons, all of the colors have already been taken. But we did have a plan. After much soul-searching and many long discussions late into the night, we developed what evolved into the Escape Plan, a unique program designed to help safely and effectively treat Adultitis. We wanted to create something that would be structured, yet personal and unique to each person who tried it. We wanted it to be a real-world solution, which is why it doesn’t advocate that you pay your bills with Monopoly money, take up a strict diet of chicken nuggets, or quit your job to mess around with Play-Doh all day. That’s childish. The Escape Plan is about becoming more childlike. It’s about re-programming our grown-up selves to see life through a different lens. 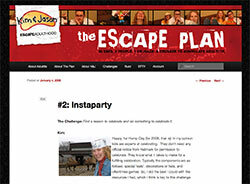 In 2006, The Escape Plan started as a very public experiment. We volunteered ourselves as the guinea pigs and readers voted on who was more creative and childlike with each challenge. Kim edged Jason in the voting, but we were happy to see that the Escape Plan produced an outcome of real and lasting change in both of our lives. Since then, thousands of people have followed suit. Adultitis leaves its victims in shackles, weighing them down with stress and anxiety while keeping them from the simple peace and joy they had as children. The Escape Plan is like a key, designed to unlock our minds and free our spirits. It’s pretty simple, really: The Escape Plan is a series of 40 challenges designed to get you thinking and acting in a more childlike way. If you feel like you have symptoms of Adultitis and are ready to do something about it, you’ve come to the right place. With this approach, you can simply read and explore the 40 challenges on this very website, including the examples of what we did our first time through. Plus, through the comments in each post, you can share your adventures with other Voyagers and get inspired by what they have done. Start now with Challenge #1! If you want something to hold in your hands, the printed Escape Plan Journal might be for you. It features all 40 challenges, including what we and a host of others have done for each one, along with journal pages for you to record your experiences and personal observations as you go along. The field journal-style coil binding makes it easy for writing and super mobile. It’s a great option for people who like the smell of real books. The book is just $25, which is kind of a steal for such a proven Adultitis-crushing tool. Buy it here. Warning: This project is quite challenging; all change is. But it’s also a TON of fun. We invite you to follow The Plan and see what happens. What would your life look like with a lot less Adultitis?